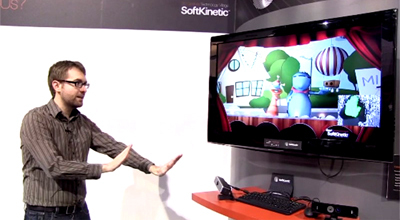 SoftKinetic is one of many sensor companies promoting 3D cameras in the wake of Microsoft’s success with the Kinect motion sensors for the Xbox 360. But while Microsoft has already sold 18 million Kinect system, Michel Tombroff, chief executive of SoftKinetic, says motion-sensing technology is just getting off the ground. Tombroff says the company’s “time-of-flight” technology is more responsive than the PrimeSense technology used in the Kinect system and that makes applications using SoftKinetic more accurate. With time-of-flight, the camera sends out a signal into a room and waits for it to bounce off of an object. When the signal returns, the SoftKinetic software calculates how far away the object is and then draws a 3D map of the space in front of the camera. It can do this in real-time, as you can see in the video below. Microsoft launched Kinect in the fall of 2010, but Tombroff says technology has moved forward since then. His company showed off some examples at the Consumer Electronics Show last week in Las Vegas. Potential uses of the hardware range from controlling your TV or shopping for clothes online in a virtual dressing room. For instance, you can get close to the PC with the “near mode” interaction, which allows you to be as close as 10 inches away from the sensor and still be detected. With Kinect, you can’t get closer than three feet or so. So you can sit at a PC and control what is on your screen without having to touch the screen. The system can recognize two hands or a single finger raised. Guru Golf was at the SoftKinetic booth at CES, showing off its golf training system, which tracks your swing and offers analysis and training. SoftKinectic has a camera dubbed the DepthSense DS311, which using time-of-flight technology to calculate the position and movement of objects in a 3D space. It also has a 3D gesture-control development system dubbed Iisu 3.0 that developers can use to create new applications. SoftKinetic creates its own gesture-control games as well as the middleware that developers need to make sense of the sensor data. In this way, Tombroff says his company provides a whole solution for customers. The SoftKinetic technology has been used in creating interactive marketing applications, such as the digital interactive art work in the lobby at Yahoo’s headquarters, pictured left. It has been used to show off the Disney movie The Sorcerer’s Apprentice in theaters, and it has been used on a large interactive wall by Bally Total Fitness Centers to encouraging exercise.